Vibe Standard colors consist of primary and secondary colors including UV responsive, metallic and glamour colors. 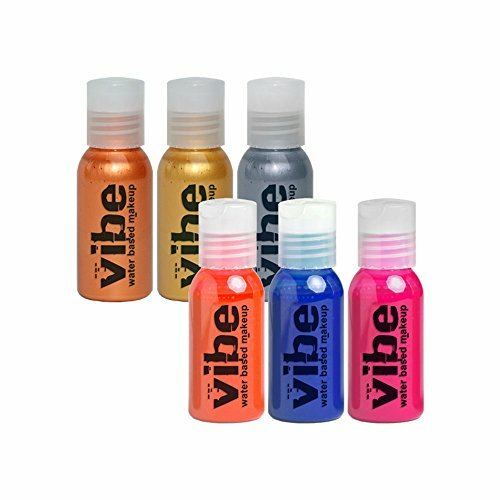 The Vibe water based airbrush makeup is the cornerstone for face, body art and body painting applications. It is highly pigmented, smudge and transfer resistant, moisture resistant, instantly dry and it can be washed off with soap and water. Vibe is completely water based without any alcohol making it a superb alternative over common hybrid makeups containing solvents. Most importantly as low as 7psi is needed for application making Vibe the most "application friendly" and demanded airbrush water based makeup available on the market. If you have any questions about this product by European Body Art, contact us by completing and submitting the form below. If you are looking for a specif part number, please include it with your message.